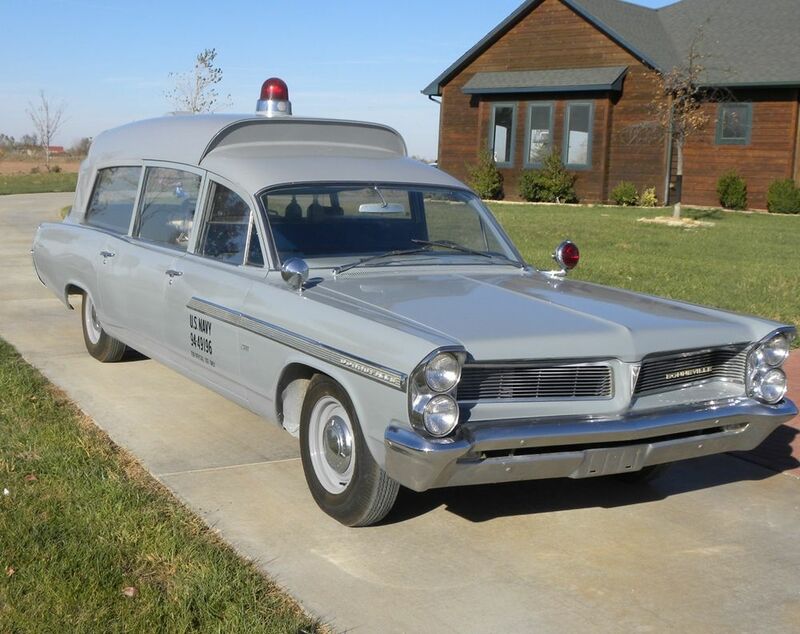 ﻿ If you've been following the Barrett-Jackson auction coverage from Scottsdale, Ariz., this weekend, you no doubt caught all the hoopla about the 1963 Pontiac Bonneville Ambulance that purportedly carried John F. Kennedy's casket through Washington D.C. The controversy stems because the consigner and Barrett-Jackson claimed the ambulance was the real deal, then Internet sleuths learned that the official ambulance had been destroyed by government order, then the auction basically said, "you're buying the mystery surrounding this car." Kennedy limo-no doubt about it. The auction had a long-winded "explanation" before the sale about how the VIN plates matched the records for the actual car, but one was screwed on instead of riveted, so they dug further, etc. Whatever. There are photos of the original one being crushed, although it's hard to understand why that was even necessary. My guess is that the real one was in fact crushed, but this one, which was probably scheduled for the same fate at the same junkyard, was fitted with some of the serial number and VIN plates from the crushed one. Who knows, though. There's always some new mystery surrounding the Kennedy assassination--why should this be any different. In the end, some guy bought an ugly battleship grey '63 Bonneville Ambulance with what appeared to be a mediocre restoration and a good "story" for $120,000. God bless America. What isn't in question is the location of the Lincoln Limousine that JFK was actually shot in. That certainly was not destroyed, because it is resting comfortably in the Henry Ford Museum in Dearborn, Mich. I've reported on the Henry Ford Museum here before, but actually went there again when I went to the North American International Auto Show earlier this month. So naturally, I brought back a brand new batch of pictures, including several things that I failed to cover the first time. The Kennedy limousine isn't the only item in this collection that has huge historical significance. They actually have the chair in which Abraham Lincoln was shot at Ford's Theatre in 1865. They have the Lincoln limousine next to which Ronald Reagan was shot in 1981. And they have the GMC bus in which Rosa Parks refused to give up her seat in 1955. They call the Henry Ford Museum "America's Greatest History Attraction," and with these type of artifacts on display, they make a valid claim. Of course, there are plenty of other great planes, trains, and automobiles in this museum for your viewing pleasure. Some of the cars include Henry Ford's 999 racecar, a '48 Tucker, a spectacular 1930 Bugatti Royale, the first ever Mustang, the famous Goldenrod land speed record car, and several more significant presidential limousines. Look through this blog, and you'll see that I go to a whole bunch of car shows. But there are several cars that I would never have a chance to see in person if it weren't for this amazing collection. ﻿ The permanent vintage aircraft exhibit is better than many air museums, with a Ford Tri-Motor, a Spirit of St. Louis replica that was donated by Jimmy Stewart, a dead-wringer Wright Flyer, a 1926 Fokker Tri-Motor, and a 1920 Dayton-Wright racing plane that looks, for lack of a better term, scary as hell. Trains? Yeah, they have those, too. Of course, everyone focuses on the '41 Allegheny steam locomotive, because it is like the biggest land-operated vehicle most people will ever see in their lives. But they have several other more normal-looking trains, some interesting passenger cars, and an impressive looking snow plow. Other items of note in the museum include Buckminster Fuller's Dymaxion aluminum house, a restored diner/lunch counter, an old Best Western Motel room, and a large tractor display. Of course, no one can forget the Oscar Mayer Wienermobile either. ﻿ And here's the thing about the stuff in the Henry Ford Museum--unlike the dog & pony show that went on at the Barrett-Jackson auction this weekend, everything in this display is the without-a-doubt, by God real deal. No "mysteries", no apologies, no questions. This is history--heavy history--mixed with an abundance of fun and American culture. The slideshow below has a whole bunch of brand-new pictures from my latest visit to the Henry Ford Museum. And although pictures are fun, they don't quite have the same impact as the real thing. If you're into cars, history, or Americana, I highly recommend putting a tour of the Henry Ford Museum in Dearborn, Mich., on your bucket list.